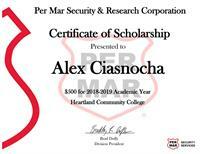 DAVENPORT, Iowa – Per Mar Security Services, a leading provider of total security solutions for residential and commercial clients based in Davenport, IA, is pleased to announce it has awarded thirteen $500 scholarship awards for the 2018-2019 academic year. Congratulations to all of the recipients of Per Mar’s Scholarship Program for the 2018-2019 school year. Alex Ciasnocha is the son of Brian Ciasnocha, Director of Sales for Electronic Security at Per Mar Centre. Alex graduated from Normal Community High School in Normal, IL where he was part of the Madrigal, Key and Social Studies Clubs. He is studying General Arts at Heartland Community College. Ashley Bodkin is the daughter of Brent Bodkin, IT Specialist at Per Mar Centre. Ashley graduated from Bettendorf High School in Bettendorf, Iowa. She is studying Elementary Education at the University of Northern Iowa. Jenna Rach is the daughter of Dave Rach, Sales Consultant for our Madison, WI branch. Jenna graduated from Craig High School in Janesville, WI, where she was in many clubs including the National Honor Societies for Spanish, Science and Art. She is studying Pharmacology at the University of Wisconsin- Madison. Kiera Hayes is the daughter of Nick Hayes, Operations Manager at our La Crosse, WI branch. Kiera graduated from the Onalaska High School in Onalaska, WI where she was a member of the Marching Band. She is studying pre-law at the University of Wisconsin-Eau Claire. Nathan Check is the son of Scott Check, Electronic Technician at our Wausau, WI branch. Nathan graduated from DC Everest High School where he played Rugby and Soccer. He is studying Physical Therapy at the University of Wisconsin- La Crosse. Patrik Essy is the son of Ann Essy, Special Events Coordinator at our Des Moines, IA branch. Patrik is in his sophomore year at the Des Moines Area Community College.